Do they really help your accuracy? We put them to the test. I'm not an old-timer. OK, I am, sort of. I'm old enough that I learned to shoot with black iron sights, unadorned with white dots, lines or other gimmicks designed to draw the eyes into proper sight alignment. I thought the shooting industry had taken a major technological leap the first time I saw a red insert on a front sight coupled with a white line outlining the rear sight of my first Smith & Wesson Model 29. Those sights practically startled me under bright, sunny skies, which, incidentally, were exactly the conditions that rendered the need for a red front insert and white-outline rear sight unnecessary. I discovered, as I'm sure millions of other handgunners did, that under dim light conditions the red insert pretty much faded into black when dusk settled in. Do night sights make a real difference in shooting performance? This Glock 17 is equipped with Meprolight sights. When three-dot sights came along I felt that they were an improvement. Still, I did most of my competition shooting with a Colt's Gold Cup that sported plain black sights, and that's pretty much the way I liked all my sights: simple, easy and uniform. Then one day I had my first encounter with tritium night sights mounted on a .40-caliber Glock. Tritium is an isotope of radioactive hydrogen, and it glows. After seeing those luminescent green dots in the darkness, I was determined that someday, given the opportunity and available funds, I'd have night sights put on my defensive pistols as well. Now, over 10 years later and being considerably better off financially, not one of my personal weapons as of yet wears night sights. In the not-too-distant past, I attended an NRA-sponsored law enforcement instructor development course during which an evening was devoted to low-light shooting. I noticed that night sights were present in abundance on many of the handguns being carried by my younger contemporaries. My chosen weapon, a Springfield XD-9, sported steel sights with the venerable three-dot system--no high-tech "radioactive" sighting assistance for me. Having spent some years in proximity to things that make Geiger counters clatter, I saw no need to up my roentgen count just to score a few more hits on target when the lights were dim. I stealthily checked most of the other targets that evening, and I was internally gloating about what that XD could do without any enhanced sighting equipment in the hands of someone who had aged somewhat like a fine whiskey. Why, some of those other lads weren't even shaving yet. Later on, I overheard a number of students discussing the merits of night sights, and the general consensus was that they were a virtual necessity if one intended to survive any given eight-hour shift on the streets. I had to agree in part that night sights were certainly handy to have. After all, when one fellow student had his plastic front sight pop off his expensive import and fall to the gravel at his feet, the luminescent glow made finding the sight much easier in the darkness. My wife often chides me--rightly so--that my military career would have advanced further had I learned early on to keep my mouth shut. But upon hearing some of the students making claims about night sights that I felt were exaggerated, I had to weigh in on the side of the "non-enhanced" sighting systems. I believed, based on my stellar performance in the night-shooting exercises, that stance, grip and sound shooting fundamentals were much more important than enhanced sighting equipment. I argued that unless one was shooting in almost total darkness at a distance that rendered instinctive point shooting useless, night sights were probably unnecessary. I suggested that in low-light situations, night sights might actually serve as a kind of distraction to the unseasoned shooter bent on perfectly aligning the sights. Taking the time to aim the pistol might needlessly prolong efforts to engage an attacker with fire sufficiently accurate for defensive purposes. Rodger Smith encounters a low-light target with a night-sighted Glock 17. Was I right? There was only one way I could be satisfied that I was correct, and that was to conduct some reality-based tests. Finding a suitable place in which to properly utilize night sights is not as easy as one would imagine. In my area there are few shooting ranges, and only one would grant me the privilege of turning off the lights. But I was extremely fortunate to locate the Belleville Shooting Range, in Belleville, Illinois. Owned by Steven King (no relation to the writer), it is a state-of-the-art indoor range for both handguns and rifles up to and including .30-06. The only indoor shooting range in Southern Illinois, it has a fully stocked retail gun shop handling the hottest-selling brands of handguns, both new and used, and also has a huge supply of rental firearms of every sort, including Class Three guns like the UZI and an H&K MP-5. Not many gun shops can boast a "try before you buy" policy. There are qualified expert trainers on hand for individual instruction, and there is a professionally designed and equipped formal classroom as well. It was there that my modest test was conducted. I felt that the fairest test would be to use the maximum distance at which one could identify a target. Since white linen suits are no longer the attire of choice for drug dealers and street thugs (potential cop killers and car-jackers like to blend in with their environment), shooting would be done at darkened silhouettes. I was able to create the proper range and lighting conditions that eliminated any hope of quickly and accurately aligning standard black or three-dot sights, so instinctive shooting utilizing proper stance, grip and sound shooting fundamentals would be the rule when using standard sights. For the purposes of this test, two identical Glock Model 17 9mm pistols were used. The only difference between them was that one sported the standard white-dot front sight with a white-outlined rear sight, while the other was equipped with Meprolight night sights. Ten yards was determined to be the maximum effective range for target acquisition in our low-light situation, and frankly, all the shooters pretty much agreed it was on the ragged edge of a couple feet too far. Any farther away and we would have to introduce additional light to simply make out the silhouette, and this would render the non-enhanced sights visible. Any closer and the silhouette could be engaged strictly with instinctively aimed fire, and the shooter might ignore the sights altogether in favor of pure speed. No warm-up fire was allowed the shooters. Using timed fire beginning from the ready position, shooter No. 1 was asked to fire three shots with night sights, taking only the time necessary to personally feel comfortable that he was placing center-mass hits in the target. The point was not to shoot tight groups but to achieve adequate defensive accuracy for the given distance and lighting conditions. The exercise was repeated twice, and the times were recorded. Group size was measured after all the shooting was over. Night sights are offered on many factory guns. SIG's Equinox has a Truglo fiber-optic front sight and a SIG rear sight with tritium inserts. Now shooter No. 1 was given the gun with stock sights. The same course was fired with the same instructions: Go for center-mass hits, and use only the time necessary to reasonably guarantee them. Shooter No. 2 performed the same two tests, followed by yours truly. We did not shoot a slow-fire stage to obtain the smallest groups, for it was considered a given that a night-sight — equipped firearm would have a definite advantage there. Before I get into the results of my informal test, I wanted to point out that I had never before fired a pistol with night sights in a low-light scenario. Other than the fact that the sights stood out like a full moon on a blanket of freshly fallen snow, I noticed some important things that I feel must be commented on. When one is concentrating on the front sight, one's focus is directed exactly where the brightest part of the muzzle flash, which is visible to the shooter, is going to manifest itself. With night sights, the muzzle flash did not totally eliminate the ability of the eye to retain a constant sight picture. The flash did, however, cause havoc in picking up the darkened target silhouette for subsequent shots because after the flash, the light from the night sights was visually stronger than the image created by the silhouette. Imagine how badly the flash would have affected the shooter if the gun had been ported. Lesson? Ports really have no place on a defensive pistol. With stock sights it was next to impossible given the amount of light I allowed for this test to make out the white dot and outlines before the muzzle flash. After the first shot was touched off, the muzzle flash destroyed any hope of recovering the pale white dot and outline for subsequent shots. In this instance, visually recovering the silhouette target was actually easier than with night sights. I have one last comment about muzzle flash. Muzzle flashes can destroy or severely diminish night vision, and they will not illuminate any but the closest of targets and should not be relied upon for that purpose. I do believe they have a purpose, however. What they can do is allow the shooter to call his shot. At the moment of firing, the muzzle flash creates a strobe-like flash that perfectly silhouettes the position of the sights at the exact moment of the shot. It is then possible to instinctively make minor corrections for subsequent shots. Using this technique, I was able to call an errant shot during the phase where I was using stock sights. Sure enough, when checking the target later, I had missed the silhouette high and to the left just as I had predicted. I had entered into this modest test to determine if adequately accurate fire could be directed at a target in extremely low-light conditions without the aid of enhanced sighting equipment. While I found that, to a point, it could, I also discovered some serious flaws in my earlier theories concerning this. Rather than report each individual's performance (I don't want to embarrass myself), I averaged the aggregate times and groups for each weapon. What did I learn? Well, remember my argument that in low-light situations night sights might actually serve as a kind of distraction to an unseasoned shooter bent on perfectly aligning the sights, and taking the time to aim the pistol might needlessly prolong efforts to engage an attacker with fire sufficiently accurate for defensive purposes? Well, you can toss that theory right out the window. There was statistically no difference averaged between the times our shooters took to attempt to align the sights, whether or not they glowed in the dark. I had argued that unless one was shooting in almost total darkness at a distance that rendered instinctive point shooting useless, night sights were probably unnecessary. However, I learned that the term "unnecessary" taken literally is essentially misleading and should never be confused with "useless" or "needless." This is an important distinction. ity. But saying that night sights are not absolutely necessary is not the same as saying they are unnecessary. Confused? It is true that stance, grip and sound shooting fundamentals are much more important than enhanced sighting equipment. However, I learned beyond a doubt for my own purposes that night sights offer unquestionable advantages to both the average shooter with limited or no low-light shooting experience and the police or security officer who periodically trains in low-light scenarios and works under similar conditions. The author's Springfield XD-9 comes standard equipped with quality steel sights utilizing the venerable three white dots. With adequate light, the sights stand out perfectly. As light fades, their utility diminishes to the point where they are no better than plain black sights. I might point out that the three of us who performed this test were all experienced law enforcement officers with considerable firearms training, but two of us were complete night-sight skeptics at the outset of the test. Our skepticism has essentially been disproved. While our average time of fire was virtually identical for both weapons, the average group size for the night-sight — equipped weapon was almost exactly 50 percent smaller, and there were 100 percent hits on target. Keep in mind that the misses recorded with the non-enhanced weapon might theoretically represent potential tragedies to an officer or private citizen in a defensive shooting situation. So, should you run right out and purchase night sights for your defensive firearms? Of course, that must be a personal decision. If you do, you might check out the offerings from Truglo (www.truglosights.com), Meprolight (www.meprolight.com), Trijicon (www.trijicon-inc.com), Ameriglo (www.ameriglo.net) and Novak (www.novaksights.com), to name a few. 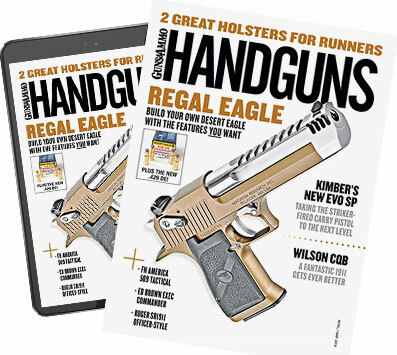 What I will suggest is this: We shooters have an almost obsessive tendency to buy accessories for our pet pistols, such as aftermarket grips, extended mag releases, full-length recoil-spring guides, triggers, hammers, springs, buffers and a whole host of fancy doo-dads that may or may not enhance our ability to poke holes in targets downrange. I believe none of them has an application as critically important as being able to assist the shooter when available light fails and the boogey-man is sneaking down the hall with ill intent. I would have to state that now--for me, at least--night sights are truly necessary.